Can Conservation Biology Survive the Anthropocene? Jon Hoekstra, Executive Director of the Mountains to Sound Greenway Trust and Island Conservation board member explains the damaging role invasive species play in biodiversity loss at the Harvard University “Ecological Systems in the Anthropocene” lecture series. Elizabeth Wolkovich: What are the major threats that you think are driving species onto the IUCN Red List and declining populations to possible extinctions? Jon Hoekstra: I’d agree that the notion of biodiversity loss is qualitative as well as quantitative but on the extinction front I’ll actually pull one that’s not fashionable anymore but that I think is right up at the top of the list—and that’s invasive species, introduced species. Here is why: 80% of documented extinctions since 1500 have been on islands. 40% of species on the Red List today are on islands and about half of those species are threatened by an introduced vertebrate–usually a rodent, a mouse, or a rat. That is a nicely quantified, diagnosed problem. About 75% of those species threatened on islands by an invasive vertebrate could be saved. You can actually eliminate that extinction risk by removing the invasive. So there is not just a threat but there is a solution out there that would get at about 1/4 of your threatened species. Peter Kareiva: Right, but you know another way of rephrasing that; I was recently talking to some students about how invasive species were not a big deal but you’re right about the islands. The interesting thing that you are right about–another way to reframe that is to say that we don’t really have a biodiversity extinction crisis, we have an island biodiversity extinction crisis. Stewart Brand has written a really interesting article on that. Jon Hoekstra: If you want to get after preventing extinctions so that you just keep the raw material of biodiversity, then that’s where you do it. You’d prioritize islands and you’d prioritize invasive species. Sanjayan: Today extinctions happen rarely and when they do happen that we know of, they tend to happen on things like islands. They happen on islands. Jon Hoekstra: And it is preventable. We actually can solve that one. Elizabeth Wolkovich: It seems like you were all slightly talking about uncertainty and certainty, like we know that we see extinctions on islands and then there is the big debate about–how many extinctions have we committed to? But we do not really know because we don’t know at what population level we should be worried or where this is going. So given that uncertainty do you still put invasive species first? How do you balance what to do when maybe climate change will drive many, many more species extinct but your uncertainty level around that number is higher? Jon Hoekstra: You have some time. There are imminent extinctions. The last bat on Christmas Island went extinct because the Australian government needed to have a committee to talk about what we should do about it. They had the warning and they just went slowly. So I think there is an urgency. If you are concerned about biodiversity and you want to make sure we have species, the diversity of species then I think you have to make sure you don’t drop the ball on some of the really urgent ones even as you keep your eyes on the long-term prize. Sanjayan: And it is also doable. I mean, that is the other piece about it. The island thing is actually really manageable. You can actually do something about it for not that much money. Elizabeth Wolkovich: So you would go after invasive species on islands as well as your top priority. Sanjayan: I would put it in the top five. I’d be fine with that one. Elizabeth Wolkovich: And where would you put climate change in that top five? Sanjayan: I’d put it in the top five. Peter Kareiva: We are going to get seven in the top five but that’s okay. Sanjayan: Habitat loss—because of agriculture, climate change, invasive species, accumulation of pollutants in systems which are like a ticking time bomb, and loss of big wild animals. Elizabeth Wolkovich: What do you think are some of the biggest successes you have seen from where you are now and from previous global organizations you’ve worked with? Jon Hoekstra: I like things that demonstrably work and that can scale. I’m going to come back to the invasive species one because I think here is a really good one that plays out. Pinzón Island in the Galápagos was infested with rats and as a consequence the Pinzón Tortoise had not reproduced in the wild for 150 years. Rats were removed and baby tortoises started surviving. It’s amazing. It’s really cool. I mean this is like a Darwin era impact that suddenly…I saw the photograph of the first baby tortoise emerging from the nest. It was really inspiring and motivational just to see. And that is one single example I think as an inspiration from a story perspective. People can get their heads around that one and say, “Wow, that gives me some hope that you can do something for that.” Then you can scale that. You can take that intervention and you can say, okay, where else are there opportunities to do that thing? I’m involved with another organization called Island Conservation that they’ve mapped it out. 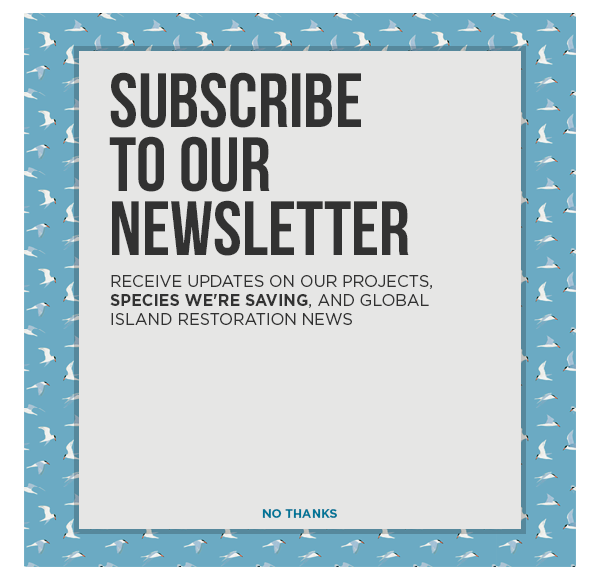 They’ve gone and they’ve documented all the islands that have threatened species and how many of those islands with threatened species have an invasive vertebrate and whether you could remove it. That’s a nice combination–it is a local thing that can scale up and you can actually have a meaningful, global impact on the statistics of biodiversity loss by doing that.